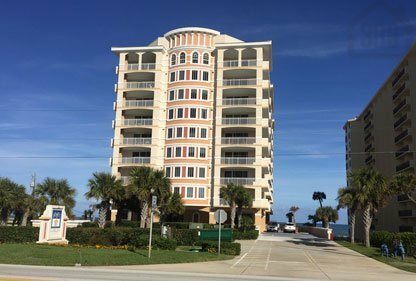 The Capriana condos are located in Ormond Beach and offer a relaxing, scenic oceanfront lifestyle. The building’s striking architectural aesthetics are the first thing that catch your eye, where dramatic arches and angles culminate into truly welcoming display. Inside you will find spacious floorplans, with each room having plenty of space to spread out and enjoy your beachside life. There is plenty of room to entertain company and relax on the sprawling balcony. The Capriana is convenient to area markets, retail shops, restaurants and attractions like the boardwalk, and of course the “World’s Most Famous Beach.” Call us today to explore available homes in Capriana or other great oceanfront condos in the Daytona Beach area. The Capriana condos are located in Ormond Beach just north of Granada. This newly constructed condo offers wonderful amenities that will please the pickiest condo buyer. One of the positives about this building that you will notice right away is the size of the rooms. The kitchen, bedrooms, bathrooms, and living areas are all very large. There is plenty of room to entertain company and relax on the large balcony. The Capriana condo is a great place to have a second home. Kevin Kling has the real estate experience and knowledge to help you buy or sell a Capriana Condo. Give him a call ph. 386-527-8577.